"Whatever our sign needs, directional signs, pool signs or vehicle graphics, I know I can count on them for great pricing and service." Promotional Products take on many different categories. From pens to mugs, hats, T-shirts, frisbees and clocks, to just about anything else a business’ name can be placed on. 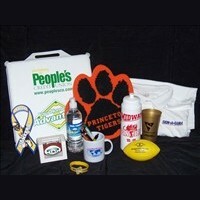 Remember to use Promotional Products as giveaway items as they help to increase a business’ exposure. CLICK HERE to browse over 1,000,000 promotional products available at SIGN-A-RAMA Southwest Orlando!